I saw my psych doctor yesterday and discussed with him my issues with sleeping at night, staying asleep sometimes, and that I experienced a 6 week long hypo-manic episode which is completely unusual for me. My bipolar, when unmedicated, was very rapid cycling, so even this weird mixed episode lasting 6 weeks is very odd and out of the ordinary. He suggested for my issues getting to sleep I try Klonopin and see if it helps. I don’t expect to take it every night but on nights when I’d otherwise be up until 4am, hopefully it will help. They are 2mg tablets, and I took one last night. I fell asleep within 30 minutes and slept for 14 hours straight through. I bought a pill splitter today so will try a half of one tonight instead. 14 hours sleep is a bit excessive. I also returned a few skeins of yarn I overbought for my current blanket project and got a few dollars store credit. Its not a lot but I couldn’t see any need to keep that particular excess in yarn. The blanket, after I did the math on paper, has 24 more rounds before its finished, if I stop at only one round of off white on the outside edge. It will definitely be big enough for the intended person’s bed when its done. Monday night while we were at pool league, I took some yarn and a hook and in about two hours between games and the following afternoon, I put together this hat. It looks better on an actual person then it does on my foam head. 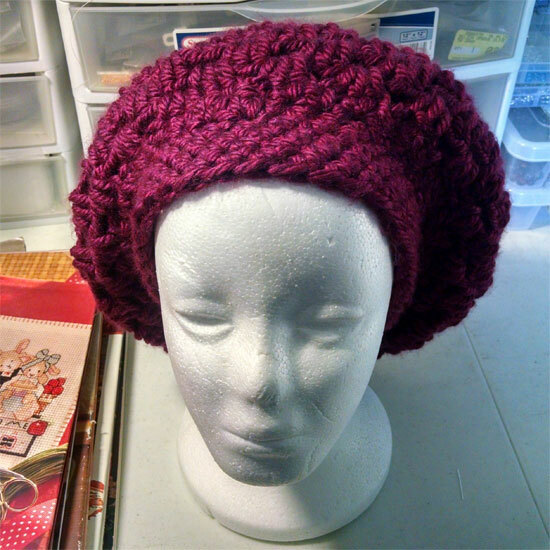 I used super bulky Lion Brand Hometown USA yarn and the majority of the hat is HDC, but the opening edge/rim is SC. 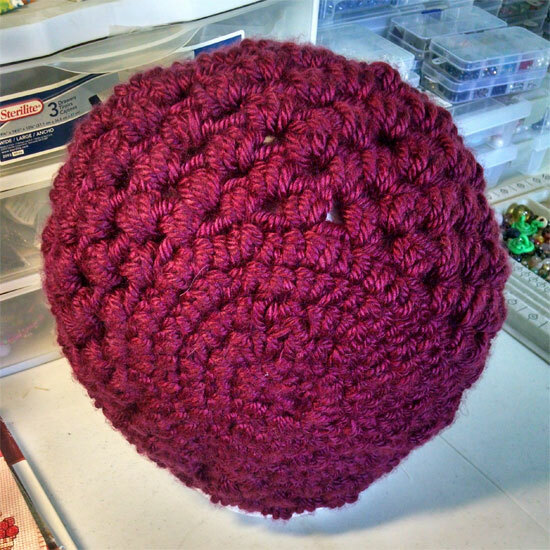 Some of the stitches were done granny square style as well. I’m really happy with it especially since it only took 2 hours to make! Food today has been pretty good. I did some snacking, but dinner was healthy and I still have room in my day to cut up and split that cantaloupe with Mattie later when he gets home from pool tonight. Dinner looks kind of gross but it was so good. 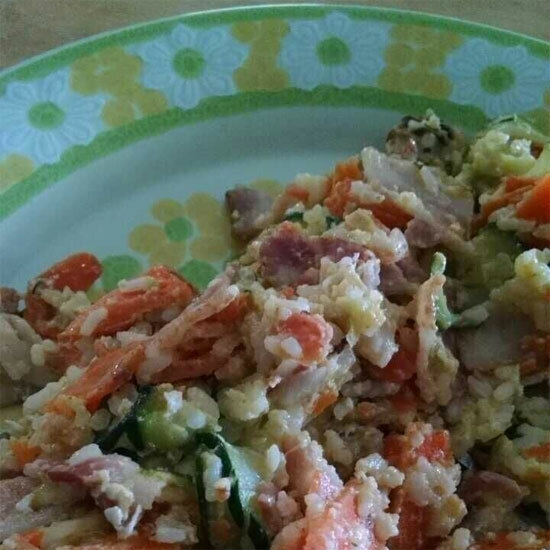 I thin sliced 2 zucchinis, about a half a pound of carrots, two bunches od green onions, chopped, 1 cup dry white rice, 2 eggs, and a 12 ounce package of bacon, chopped. I also added garlic powder. It all went into the wok and was periodically stirred until everything was cooked and the loose moisture had been cooked off. It tasted so much better than I expected! Mattie felt the need to add soy sauce but he said he would eat it again, so that’s good. Not a lot else to share right now. Mattie’s got pool again tonight so will probably just watch some TV in the bedroom and work on the never ending blanket for a while!